If you’ve got an interest in applying conversational hypnosis in more FLUID, STRAGETIC and EXPANSIVE ways – the message on this page is for you. See I recently delivered a high-level Applied Conversational Hypnosis Roundtable Training. It was quite an exclusive affair. HOW to “aim” conversational hypnosis at specific people, in specific contexts for specific results. The Applied Conversational Hypnosis Roundtable training was grounded in human psychology and cognitive reality. And how human psychology and cognitive reality mix together with conversational hypnosis. Sounds a bit high-brow on this page, perhaps. But it’s critical stuff to be aware of. At the end of the day you need to be aware of and understand HOW human psychology and cognitive reality “mix-in” with conversational hypnosis. Because once you do it’s like two cogs finally getting traction with each other and generating movement. I guess you could say conversational hypnosis is one cog. And human psychology and cognitive reality is another cog. That is the reason, in essence, why some of my best students wanted the Applied Conversational Hypnosis Roundtable Training. They always want to excel. And keep on excelling at applied conversational hypnosis – in all kinds of practical (results-orientated) ways. (note: “technique constipation” is knowing lots of techniques, such as lots of conversational hypnosis techniques– but still not FULLY knowing or having the natural confidence to put them into practice in an ongoing way). THAT is the part you must somehow get handled. Maybe you’ll figure it all out all by yourself. But it took me years. And more stress and frustration than I’m willing to think about right now. The upshot of that though is that I am now able to “see behind the curtain” (so to speak) and see the best way to view the “mechanics” of conversational hypnosis – you know, so you can actually apply it (USE IT!) in a STRATEGIC, RESULTS-ORIENTATED WAY in real life situations. And I am now able to communicate that understanding to other people in a relatively quick and engaging way. In short… when it comes to conversational hypnosis… I can give you the unique understanding and insight into human processing models… and in doing so you’ll become FREED UP to use the conversational techniques in a useful, meaningful and STRATEGIC way in your own life — both socially and at work. The Applied Conversational Hypnosis Roundtable was not a usual training or skills-practice type event. Allow you to be the best practitioner of conversational hypnosis you can be (i.e., the insights and mental models FREE YOU UP to use all the techniques you already know… and even freestyle your own techniques if you want). We also explored and deep-dived into an understanding of the mental models that other people “filter” conversational hypnosis through — understanding this aspect is like understanding the slope on a putting green (i.e., it gives you the ability to know just where to “aim” your conversational hypnosis and how much “weight” to put on it based on the situation and the mental models of another person). The importance of the Merlin leadership role of the conversational hypnosis practitioner (and how it differs from other leadership or authority styles). Discussion on changes in strategy and ensuing outcomes (with an example of “dwarfs” cleaning up against the “giants” in the basketball league). The role of the macula (a part of the eye) in hand-eye coordination. How Matt Seibert (of Insight Firearms Training) uses aspects of conversational hypnosis to teach people to shoot an entire clip through the same hole on a target within the first 10 minutes of holding a gun. You’ll hear the story of how Matt worked with a man with Parkinson’s disease (with shaking hands) and how Matt used conversational hypnosis to turn the man into a precision shooter. The importance of end-state energy as it pertains to goals. The importance of role models and how to emulate the feeling of your role-models. A discussion on how to use doubt as a mechanism that dissolves reality. How to use the Authority Principle (from CBT) in hypnotherapy / conversational hypnosis. A discussion of the difference between the Instant Authority Technique and Narcissistic Pride. How mind bending language is an educational process and how education is hypnotic. The rock climbing metaphor of successful and efficient goal achievement. An example given of the Contradiction Blowout to dislodge long held beliefs and entrenched attitudes. How flow states are the key to learning. An exploration on the difference between a Self-Fulfilling Prophecy and Self-Delusion. How to appeal to someone’s identity to change or “upgrade” their performance levels. How to best frame questions in an interview to get yourself selected for a job. How to model someone with Big Talk questions. How to use revivification in a job interview or business meeting. The important difference between a goal-orientated identity and a process-orientated identity. 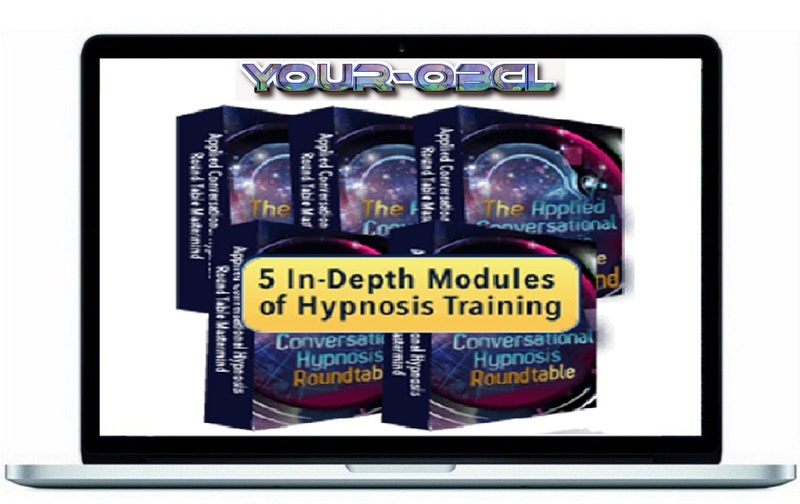 How to use Applied Conversational Hypnosis as a self-fulfilling prophecy tool in coaching. My closing circles analogy — and its association with deep practice and continual (unconscious) improvement in any skill-development. The concept of the “people whisperer” — and how it is the key attribute of the most successful conversational hypnosis practitioners. If you ever feel you want more CLARITY and STRATEGY on HOW to apply conversational techniques as an integral part of your communication strategy then I strongly recommend you get instant access to the Applied Conversational Hypnosis Roundtable while it’s currently being made available. It will “unclog” you of a lot of confusion and “technique constipation” (i.e., knowing lots of conversational hypnosis techniques — but not knowing or having the natural confidence to put them into practice in an ongoing way).